Ataribox shocks the world. Can Splatoon 2 survive the ridiculousness of the Nintendo Switch voice app? PS4 is getting a major update and a new service aims to help people build a better PC. Then, it’s our main topic, local co-op gaming! We talk about its history, its evolution, its near death, and just maybe, its rebirth. 36:00 – Local Co-op and will it survive? 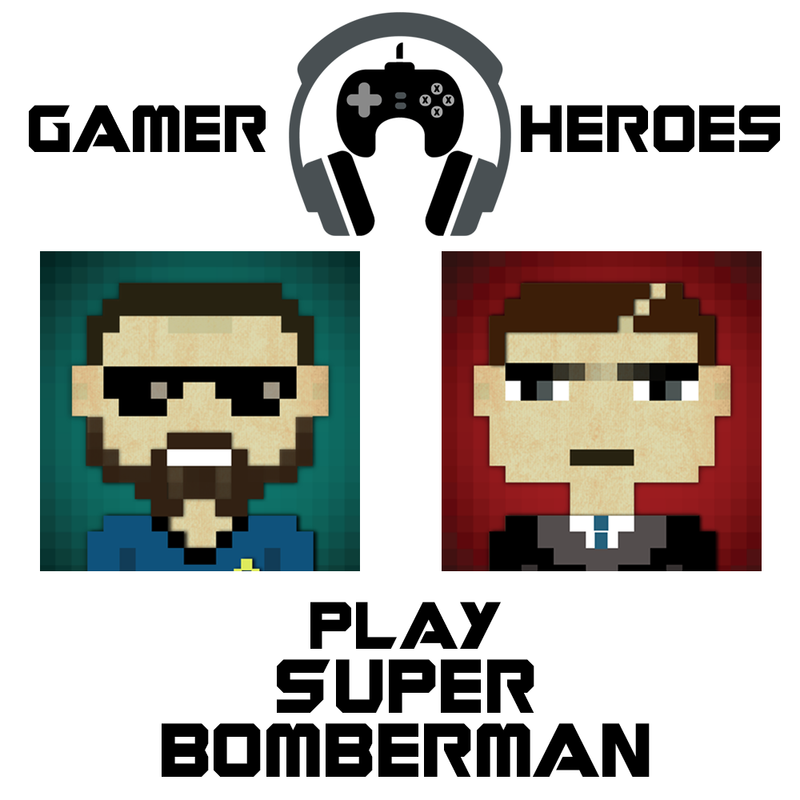 Gamer Heroes makes the move from podcast to streaming as Jon and I play some Super Bomberman on the old SNES. That’s right, we start back in 1993 with a classic Super Nintendo game featuring the likes of the White, Black, Red, and Blue Bomber… people. Check out the video below and subscribe to us on YouTube and Twitch to catch our latest video game streams. We’ve got some other fun SNES streams coming soon including the Aerosmith game, Revolution X, Top Gear 3000, and Super Street Fighter II! So what did you think? Are Jon and I just the best Bomberman players you’ve ever watched? No? Yeah, didn’t think so. Let us know which games you’d like to see us stream. We’ll be playing more SNES plus adding games from other Nintendo platforms like the N64 and Switch and even other modern titles from Xbox and Playstation. Stay tuned! The following is a review I wrote in 2010, three years after the release of third installment of the legendary Halo series. So forgive the poor writing of a 17 year-old high school student. I simply thought it would be a fun throwback on a huge game in my history. I’ve edited some glaring grammar mistakes and some things that didn’t make any sense, because they were really bad….I’m an English teacher, forgive me. But other than that, the review is complete in all it’s retro glory, so enjoy!! Halo 3 has a very bland campaign as far as story line goes, but comes jam packed with action and conflict offering a very balanced difficulty on all four playing levels: Easy, Normal, Heroic, and Legendary (and Mythic after locating and activating the Mythic Skull) which is where I think that the first Halo may have made a mistake. Feel free to argue with me on this one, but I think that the campaign on Halo: Combat Evolved was far too difficult. This may be simply an excuse cause I have yet to finish it on Legendary but that’s beside the point. Like I stated earlier the campaign on Halo 3 is very bland and offers little character development or story. In this area, its predecessors succeed where it fails. If you are planning on buying this game simply for story then you will be disappointed. It’s very difficult to follow and all the characters (including Master Chief) are very flat. It took about three plays through the game to actually figure out what was going on. Now on a much brighter subject the multi-player. The Halo franchise is and always will be about the multiplayer. If you are one of those wackos who still think it’s all about the story, please read again the first couple of paragraphs. (Future Kyle interruption, you probably also read those horribly written books too! Ok future Kyle out.) Halo 3 brings a few extra things that the originals didn’t offer such as additional equipment like power drains and bubble shields. I am still trying to figure out if I like these or not and I’ve been playing this game for quite a while. They add little to the gameplay and seem pointless at times but there are a lot of people who can execute them with great skill and it really adds to their game strategy, then there are people like me who just don’t use them that much. Ehh to each his own I suppose. One of the earlier complaints about the multiplayer was constant lag. The game still is somewhat laggy online on a few occasions but for the most part its pretty normal. Not nearly as bad as MW2. The only problem that people have expressed and I am going to completely shut down the argument is that the shields your character have are completely unrealistic and stupid! Well the point of the matter is OF COURSE THEY’RE UNREALISTIC THE GAME TAKES PLACE IN THE 26TH CENTURY FOR CRYING OUT LOUD!!!!!!!! They can get away with stuff like that, and its not a bad thing that it is harder to kill someone; it just requires a different skill and technique. What did you think of Halo 3? Was it worthy of the franchise? Comment below! Should All Video Games Have A Campaign? With the advent of multiplayer over the years, the traditional single-player campaign has started to take a backseat so that developers can focus more attention on multiplayer. This started to happen with Call of Duty as the campaigns began to feel more tacked-on. However, that franchise has never shed the familiar shell of campaign. A campaign seemed to be obligatory, calling out to the early days of gaming when there was no online play or even splitscreen multiplayer. Then, creating a near precedent in video gaming, Titanfall was released with no campaign and to take this matter further, DICE has already announced that Star Wars: Battlefront will not have a campaign either. But the question remains: do all video games need a campaign? This article will attempt to look at both sides of the issue and possible exceptions. It is the opinion of many gamers that campaigns are almost a relic of the past. Many gamers of famed franchises like Call of Duty, Halo, and Battlefield do not even bother playing a campaign. Rather, they plunge into multiplayer with their friends. There are many social gamers out there, who prefer to play video games with friends rather than go “lone wolf” with an isolating single player campaign. Other gamers are frustrated at the prospect of a tacked-on campaign. Clearly, the game was made for multiplayer. Why throw in a poorly composed campaign? Let the game be honest to the developers’ goal of an evocative mutliplayer experience. Don’t ruin a perfectly fine video game with the impurity of a terrible campaign! There is another side to the coin. Some gamers prefer all games to have a single player campaign, whether the game had a multiplayer focus or not. Many of these gamers like completing the story the game has to offer or do not have time to mess with multiplayer. They consider a game without a campaign to be incomplete and, oftentimes, sloppy. This is the opinion that all video games need to revolve around a story. The campaign and the multiplayer should reflect that. The best example that most of these gamers reference would be Halo 4. Everything in that game revolves around the central story of exploring Requiem. The multiplayer even reflects this concept, with Spartan Ops (the cooperative missions) giving teams of Spartans missions on the planet’s surface. In the competitive modes (like Free For All or Team Slayer), the idea is that the individual Spartans are performing training missions aboard Infinity, a ship stationed at Requiem. This particular game perfectly balances both single-player and multiplayer. What About A Game Like Star Wars: Battlefront? With Battlefront, the argument of campaign and no campaign becomes a bit hazy. Those in favor of a campaign tend to argue that a campaign is necessary for establishing a story; however, Battlefront already has an established story, albeit the movies. The whole point of this particular game is to recreate the epic battles from the movies. All footage from the game have basically been recreations or reimaginings from battles of the original trilogy. Since most, if not all, players are familiar with the story and these battles, is a campaign really necessary? In this writer’s humble opinion, no, it is not. Battlefront is a rare case where the universe is already established. Exposition and explanation is not necessary in this instance. Allow the players to hop into the battles they love without focusing unnecessary developmental attention on the creation of a campaign. Of course, this game will also feature single-player, should a gamer wish to fight his or her battles solo. The answer to whether a game should or should not have multiplayer has no definitive conclusion. One thing is rapidly becoming certain, however, campaigns are going away in a lot of mainstream games. Titanfall marks the beginning of the end for the campaign. In a few years, it is likely that major franchises like Call of Duty and Battlefield will also focus solely on multiplayer. Without a campaign, what will video games even look like? Do you agree? Is the end of the single-player campaign only a matter of time? Feel free to post in the comments.